1. Make the custard and place in fridge for about 30 minutes. 3. Preheat oven to 175 C - 350 F and line a baking sheet with parchment paper. 4. Unfold the pastry sheets and plac on lined sheet. Prick them all over with a fork. Bake in preheated oven for 20 minutes. Press down the pastry after 10 minutes this prefend the dough to puff too much. 5. After 20 minutes bring down the temperature to 150 C - 300 F and bake 10 minutes more. 6. Take the pastry out the oven and cut each pastry with a pizza cutter into 2 rectangles. (10 in total) while they're still hot and let them cool down. 7. 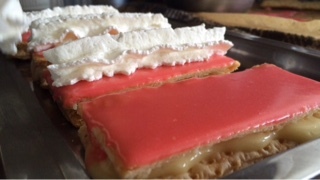 Pair the puff pastry rectangles into top and bottom layers. Decorate the 5 top layers with the glaze. Allow to set. 8. Now take the custard out of the fridge, it should be a firm mixture. Place a spoonful of the custard onto 5 bottom layers. 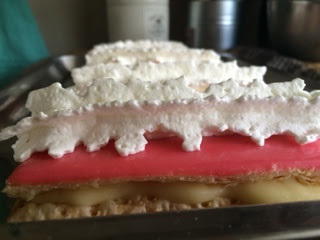 Transfer the top icing layer onto the cream layer. 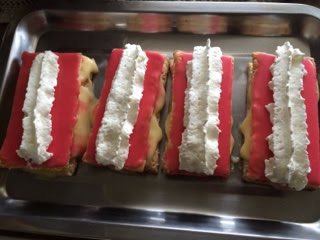 Decorate with whipping cream on top. They taste better when stored in fridge overnight.